Worthy Winner of this years Wine Tasting evening was Barbara Lewis, self confessed ‘Prosecco Queen’. Barbara came in with 5 correct answers to the wine selections and a tie breaker score of 17 in the quiz. HMVC wine tasting is run by choir member Chris Rogers along the lines of “Would I Lie To You!” whereby a panel of ‘Wine Experts’ read a hilarious description of the wine of which only one is correct. Participants must discern this for each of the six wines. Of course the descriptions are made to be very difficult to read by our volunteer experts, and are hard to pronounce when a few wines have been imbibed, especially with a few risqué statements and double-entendres thrown in! This evening panelists were Roger Wild, (Chairman), Denise Winterbottom (Ladies Chairwoman) and Graham Smith (Secretary) and all were good sports dressing up in berets and aprons and trying dubious accents like an episode of “‘Allo, ‘Allo”. Also there was a table picture quiz to help separate the scores. Nibbles and soft drinks supplied by The Ladies Group and Roast Beef Sandwiches supplied by Mary Rogers. The evening was hosted and compered by Chris Rogers. Thanks to all who took part and had a great evening. With limited tickets you don’t want to miss the next one next year! If you hadn’t heard already, Honley Male Voice Choir will sing at Penistone Paramount Cinema Theatre on Saturday 21st MAY 7.30pm. It promises to be a great concert with many of your favourites to suit everyone’s tastes from traditional through to modern classics and show tunes. The choir will be ably supported by Kevin Grunill, who is well known to Penistone Paramount and it’s superb cinema organ. All in all, it promises to be a great event so why not come along. Tickets only £8 and can be obtained from the Cinema Box Office or on the door. 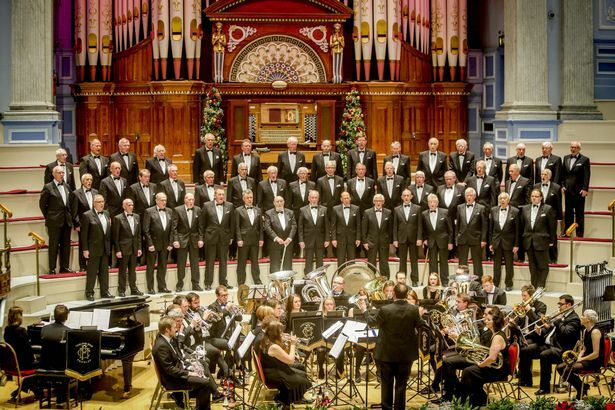 Honley MVC kick off the new concert season in April with a thank you to Friends and Patrons with an Evening Concert to “Friends – Present and Future” on Sunday 10th April 2016 at St Bartholomews Church Meltham. See Poster – aside for details. This is a FREE concert to Friends and Patrons, but anyone else can come with a ticket priced just £6. Honley men will be performing NEW elements to their repertoire along with ‘guest appearance’ from in house group “Eight in a Bar”. Why not come along if your not yet a Friend, and become one! You will be very welcome… also Men, why not consider Joining the Choir??? Come along after the concert to Wine and Nibbles (wine charged by the glass) and meet choir members. Hard on the heels of this concert the choir is again in action for the ROTARY Senior Citizens concert on 12th April in Huddersfield Parish Church. (Note the change of venue due to Town Hall Repairs). Another great Christmas Concert “Christmas with Honley” and Carlton Main Frickley Colliery Band. Here is the review by David Lockwood for Huddersfield Examiner Newspaper. Sorry about the dodgy video and raucus singing by the audience, but it is Christmas! with Carlton Main Frickley Colliery Brass Band. New CD on sale! https://chrisjrogers2.files.wordpress.com/2015/11/honleycdlores.jpg?w=150&h=150&crop=1Honley Male Voice Choir has produced a new CD to commemorate their 80th Anniversary next year. The CD is a collection of favourite songs from their current repertoire. ‘Voices in Harmony’ is the fifth the Choir have recorded over the years following on after ‘Deep Harmony’, ’Hymns with Honley’, ‘50 Golden Years’ and ‘The Pride and the Passion’ with the Band of the Royal Marines.